(Nanowerk News) North Carolina State University researchers have developed an effective and environmentally benign method to combat bacteria by engineering nanoscale particles that add the antimicrobial potency of silver to a core of lignin, a ubiquitous substance found in all plant cells. The findings introduce ideas for better, greener and safer nanotechnology and could lead to enhanced efficiency of antimicrobial products used in agriculture and personal care. In a study published in Nature Nanotechnology ("An environmentally benign antimicrobial nanoparticle based on a silver-infused lignin core"), NC State engineer Orlin Velev and colleagues show that silver-ion infused lignin nanoparticles, which are coated with a charged polymer layer that helps them adhere to the target microbes, effectively kill a broad swath of bacteria, including E. coli and other harmful microorganisms. 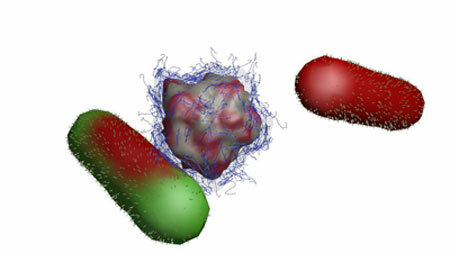 Environmentally benign nanobullet (center) attacks bacteria (left) and neutralizes it (right). The researchers used the nanoparticles to attack E. coli, a bacterium that causes food poisoning; Pseudomonas aeruginosa, a common disease-causing bacterium; Ralstonia, a genus of bacteria containing numerous soil-borne pathogen species; and Staphylococcus epidermis, a bacterium that can cause harmful biofilms on plastics – like catheters – in the human body. The nanoparticles were effective against all the bacteria. The method allows researchers the flexibility to change the nanoparticle recipe in order to target specific microbes. Alexander Richter, the paper’s first author and an NC State Ph.D. candidate who won a 2015 Lemelson-MIT prize, says that the particles could be the basis for reduced risk pesticide products with reduced cost and minimized environmental impact.